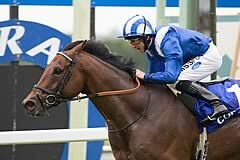 Mukhadram wins the Coral Eclipse under a fine ride from Paul Hanagan. Always prominent, Mukhadram wins from Trading Leather and Somehwat. Holt: "What were the others thinking of, they were asleep weren't they?" The Fugue a never-nearer sixth. If anyone was in any doubt that Paul Hanagan was not a top class jockey that victory on Mukhadram has shut them up once and for all. Mick Fitzgerald: "There will be plenty of questions asked of all the other jockeys." A slightly unlucky third last year when attempting to make all, Hanagan sat just behind True Story's pacemaker Somewhat this time before kicking on with fully two furlongs to run on the William Haggas-trained five-year-old. Irish raider Trading Leather was another to sit close to the pace and while he made some headway on the impressive winner, two lengths separated the pair at the line. The 100-1 shot Somewhat stuck on for third. Derby runner-up Kingston Hill stayed on to finish fourth after all the talk about his participation, but The Fugue disappointed in the race for the second year in succession after being held up way off the pace. Hanagan said: "We went a nice gallop and it just suited perfectly. If there is a horse that deserves that, it's him. He's been second in the Dubai World Cup and could have been second in this last year, I'm just so pleased for him. Everyone at the yard has done a fantastic job with the horse. I'm chuffed to bits." Haggas added: "I'm absolutely thrilled to bits, he so deserves to win a good race. It went well for him, but he was always travelling well. I've lost my voice I shouted that much. We've always believed in him and I'm thrilled for everyone he's gone and done it today. I hope the King George VI And Queen Elizabeth Stakes is next." Jim Bolger was much happier with the run of Trading Leather after he was beaten in a messy affair at the Newmarket Guineas meeting. He said: "I'm delighted with his effort after the Newmarket debacle. The winner wasn't stopping, but he was happy where he was. We'll look at the King George and later on the Arc and the Irish Champion Stakes." Roger Varian, who had left it late before giving Kingston Hill the go-ahead, said: "Frankie (Dettori) thought he felt like a mile and a half horse who was running a very good race at a mile and a quarter. The ground was fine, I don't think that was an excuse. All in all it's not a win, but he has run another fine race. "At some point we are going to have to focus on his autumn campaign, that's where his strengths will lie on the ground, but he'll tell us where we need to go next." 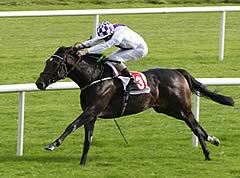 The Fugue's rider William Buick pointed firmly to ground conditions as a reason for her effort. He said: "The ground has become loose and she doesn't like it, simple as that. It was that last shower. She ran well in defeat and she'll be back."